Bring your own audience (BYOA), participant management, the beta formerly known as BYOA, and all the various other—mainly internal—working titles are a thing of the past, because Research Hub is here to stay. Research Hub you say, what is that all about? We saw far too many product managers, designers, and marketers coordinating research efforts over spreadsheets. We built Research Hub to help companies develop a true research system. We hope teams will now collaborate and coordinate research efforts in a fraction of the time. If you were part of our beta, perhaps you have tried some of the features already, but you haven’t tried them all, as we’re rolling out some of the most exciting features today. 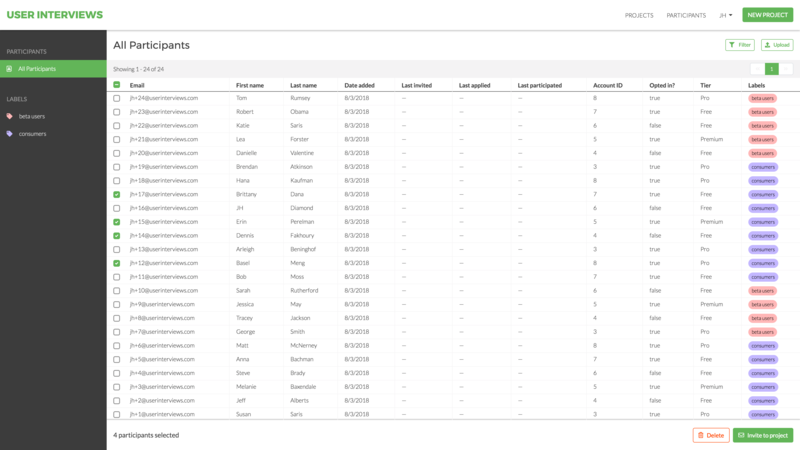 Populations – Build your own participant database. Invite users by link or CSV import. No need for them to create User Interviews accounts! Custom data to build flexible populations – Add labels, custom attributes, and saved filters to your database so you can invite individuals or large groups to a study in a couple of clicks. *Saved filters are new as of today, and we think they’ll be a game changer for how you organize your participants and quickly add them to any kind of user research session. A simple “all participants” population. View participant history – Use participant profiles to view their session history—invites, applications, participation. You’ll also be able to see custom data you add like notes, scores, who has talked with them, etc. Private projects – Create private projects from your populations using our recruiting and research logistics tools like scheduling, screener surveys, incentive payments, and more. You choose who you want to see and invite to your projects. Manage session logistics – Use our scheduling, incentive payment, screener and profile matching tools with your own users for fast, flexible recruiting. Free User Interviews audience recruiting credits – For a limited time all subscription plans include free credits to recruit from the User Interviews audience of over 100,000 vetted consumers and professionals. This is just the beginning for Research Hub. We’re excited about what we are offering you today, for a very reasonable price and with a 2-week free trial we might add, and even more excited to see how it will develop in the coming months and years. We can’t think the design partners who helped us get here enough, you know who you are. JH, our VP of Product, wrote all about the whole process of deciding to build Research Hub, and the research and iterations that got us here today. Definitely check out The Research Hub Story blog post if you like a good product story. Your feedback is crucial to that effort, so we’d love for you to try it out FOR FREE, let us know what you think, and sign up to join our future beta programs for ongoing feedback. Learn more about User Interviews.